How to File Your 1040 Tax Form - HBS Financial Group, Ltd. Wondering How to File Your 1040 Tax Form This Year? (GAL) – With the new Tax Reform Act, have you decided how to file your 1040 tax form? Many taxpayers ask that question each year, but this year most taxpayers will be filing using the new increased standard deduction. Even some of the individuals who have a simple return and don’t itemize deductions, take their records to a CPA. Most of those who choose that option are paying a high price to complete their return. Some individuals purchase a tax preparation software package, and after a lot of guesswork, do manage to get their returns done. They do wonder, however, if they received all of the deductions and tax credits they were eligible for. There’s no need to wonder how to file your 1040 tax form any longer. Simply click this link to reach our online tax partner, 1040.com, and you will quickly see why filing your taxes online is a no-brainer. 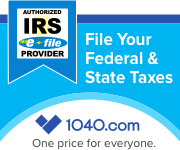 The best way is to choose a secure online tax preparation site like ours at 1040.com. Instead of making an appointment with a CPA and bringing all of your tax records to him, you can just sit at your computer in your home, when it’s convenient for you. If you do a search on the Internet for tax preparation, you’ll get many millions of results. To add to the confusion, you’ll also see many different pricing options. Don’t let that confusion discourage you. Select our online tax site at 1040.com using the link at the bottom of this page and you will see how easy it should be. Our site offers the same free federal filing for anyone who has less than $100,000.00 in gross income and also meets the conditions mandated by the Internal Revenue Service. Most of the various tax preparation vendors have fine print at the bottom of some page advising you that only the federal return can be filed for free. An extra charge is made to file your state return. At our site, we don’t need to use any fine print. We tell you up front that if you qualify to file a free federal return, there is only a small charge to file your state return. Even if you have to file a return in more than one state, the program will prepare every one of them for you. That’s why we think this is the best way to file your 1040 tax form…and the lowest cost. With our online tax filing site at 1040.com, there’s no need for you to figure out what type of return you need to file. Or what forms that you must complete. Right after you login, you’ll be presented with a few simple interview type questions. Once you answer these questions, out amazing software program will automatically select the various 1040 tax forms that you need. It will then complete them from the data that you input from the tax forms that were sent to you. There’s more too…based on your answers to the questions and the data that you input, the program will make sure that you get every deduction and tax credit that you are eligible for. There’s no need for you to guess how to file your 1040 tax form any longer. Folks, it really doesn’t get any easier than this. Our program makes sure that you will file the lowest cost return without any hassles or concerns. So the earlier question, what 1040 tax form do I need to use, is no longer difficult, or for that matter, applicable. This year there is only one 1040 tax form with up to six schedules that you may need. You can be sure that this awesome program will calculate every schedule that you have to file. And that includes any rental or business schedule as well. Check out the support too. On occasion, a taxpayer may have a question while in the program. Or perhaps advice on how to enter a certain item. Six days a week during regular business hours, we’ll get back to you usually within one hour, and there is never any charge for this. The tax code constantly changes and becomes more difficult to understand every year. You don’t need to have any concerns in that regard. We strive to make our online tax program so easy and user-friendly, that even an individual preparing his first return will be able to breeze right through. There’s no need to ask yourself, how do I file my taxes. Just take our amazing program for a test drive and see what it can do for you. Once you try this awesome program and discover how easy it is to file taxes online, you’ll be amazed as well. So give it a test drive and see if it will work for you. No need to wonder how to file your 1040 tax form any more… we do it for you. My husband has always been taking our tax returns to a CPA to have them done, and his high fee gets higher every year. We have the usual itemized deductions, real estate tax, mortgage interest, and a few charities we give to. I think that I have finally convinced him to go online and do them. We may not even be able to itemize this year with the new high standard deduction. We’ve been using your site for a couple of years now, and it really is as easy as you say. All we need to do is enter the information from the tax forms we got in the mail, and it’s done, including our state tax return. Plus, we save a lot with your site.